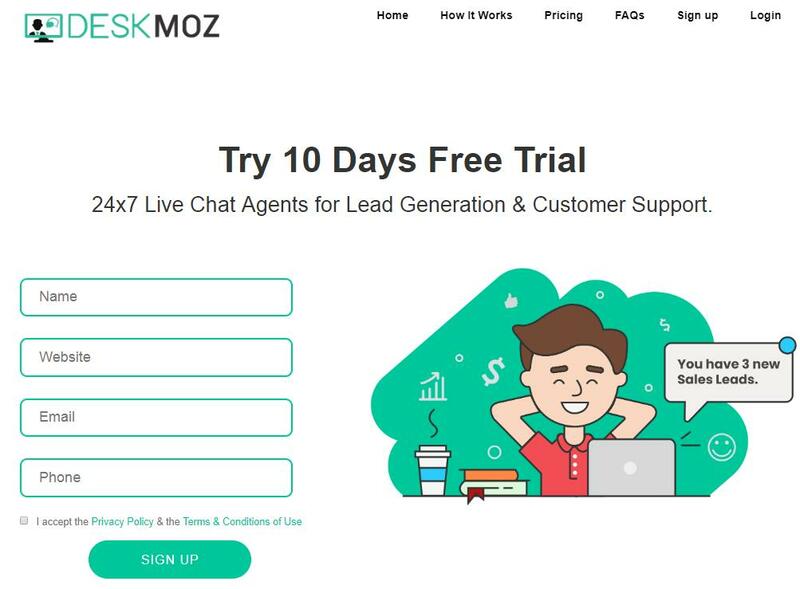 Providing seamless chat support to your visitors 24×7 & generating qualified sales leads has never been this easy. To get started with our 10 days free trial, click here & fill-in the sign-up form. 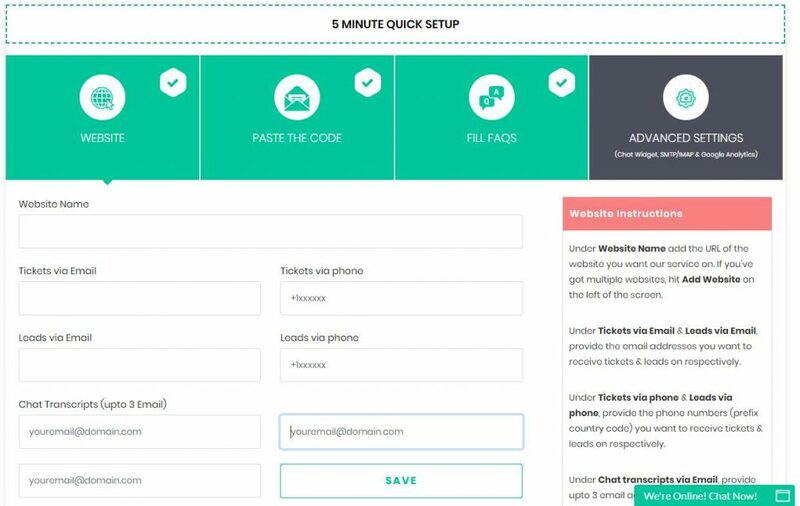 By-default the Email address which you sign-up with is selected as the Email address on which we would be sending you all the Sales Leads & the Support Tickets, but, if you want both or either of them to be Emailed to a different Email address, you can update the Email address from the Setup tab. Here, we ask you to also provide us the phone numbers we should text the Sales Leads & the Support Tickets to & add the Email addresses (upto 3) you would like to receive the chat transcripts on. After the trial, if you choose our Professional or Premium Plans, you can add the other websites from the Add Website button. You can add upto 3 websites under the Professional Plan & upto 5 websites under the Premium Plan. We ask you to share your customer support FAQs from the FAQs Tab > Add FAQ to help us start the training our Chat Agents for your website. To begin with, you can provide the basic FAQs, so that by the time you share the comprehensive FAQs with us, our Chat Agents would have already learned the basics of your business. Well, not to worry. Just let us know & we will help you in preparing a perfect set of FAQs or if you want, we can get the FAQs prepared for you on the basis of the information available on your website, get them approved from you & forward them to our Training Team. 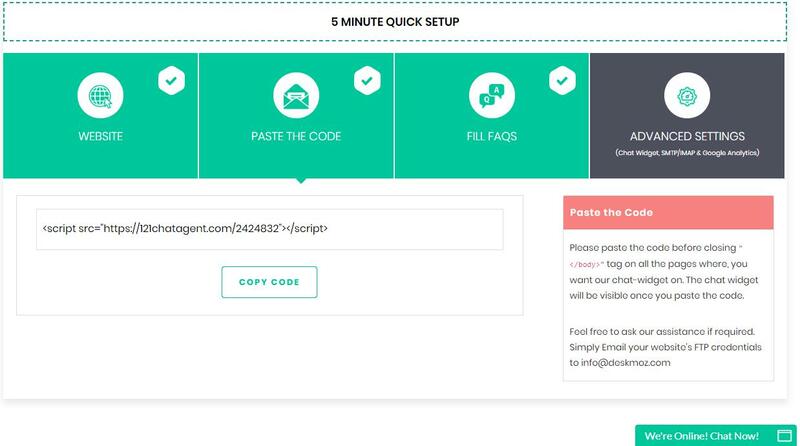 While we are training our Chat Agents, we ask you to embed our free live chat tool in your website. You can copy the code from Setup > Paste The Code & paste it right before the closing “</body>” tag on all the pages you would like the chat tool to appear. To utilize the free trial the best way, we suggest pasting it on all the pages. From the moment you share the FAQs with us, we start with the training of our Live Chat Agents specifically for your website. 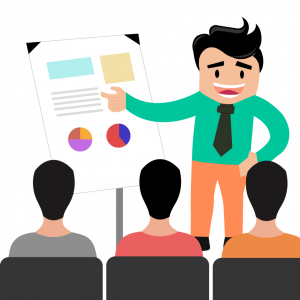 The training is provided on the basis of the FAQs, your specific instructions & your website content. Under this 48 hours training, we train at least 9 Chat Agents (2 main Chat Agents & 1 backup Chat Agent for each shift), Shift Managers, Lead- QA Team, Lead- Compliance Team & of course, your Dedicated Manager. As soon as the training gets completed (mostly before 48 hours), we will deploy our professional Chat Agents to your website. You would have already embedded our chat tool or provided access to your chat tool for that. 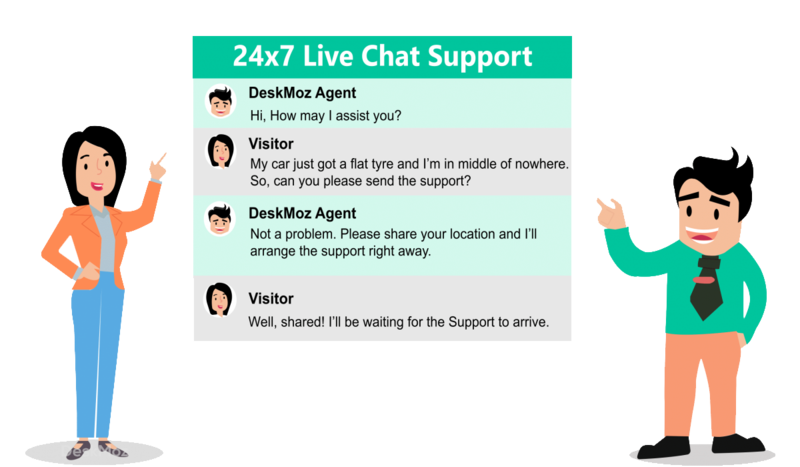 In order to ensure that your valuable visitors & the precious prospects get the most amazing support experience, our Chat Agents are going to stay live on your website 24×7 (or for the hours defined by you). You can check the up-time anytime from the Dashboard tab. 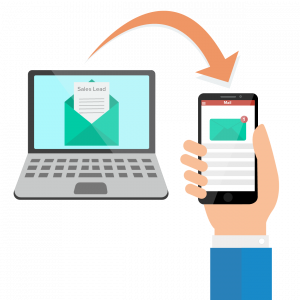 Every time our Chat Agents generate a Sales Leads or cut a Support Ticket, you will receive all the details of the chat, including the chat transcript not only by Email but by SMS as well. 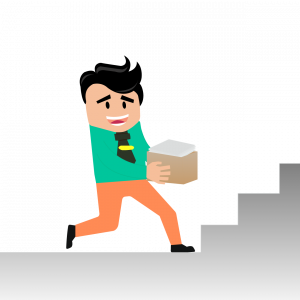 We leave no stone unturned in boosting your sales & follow-ups. Our Chat Agents don’t sit in your office, they have started working on your website just a little while ago & building expertise takes time. So, yes, our Chat Agents will make mistakes. But, in order to make them a quick learner, we ask you to point out every single mistake that we make & we promise you, none of the mistakes are going to be repeated, ever. 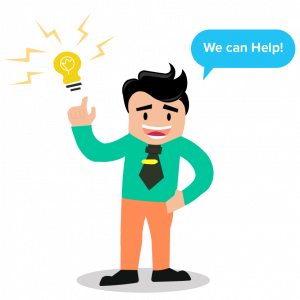 Got any questions for our Support Experts or would like them to help you in getting started?